Truly some of the sublimest singing by anyone ever. One of my Desert Island CDs for sure. Derek, why am I not surprised? Once again, you have picked one of my all-time favorite albums. I bought this within milliseconds of its release, bought it again when I wore out the first copy, and now have it on CD. I find the cd less "warm" than the 33, but that is often the case. These are some of my favorite songs ( we'll discuss Strauss' "Four Last Songs" some other day). I have many recordings, all remarkably different, but several renditions are strikingly effective in their different ways. Dawn Upshaw's is probably the most eccentric, but it is bright and quite wonderful. I like Flicka's more than you. Te Kanawa always manages to win me over, although I am well aware of her flaws. Next to Moffo, it is de los Angeles for me. But, head and shoulders above all, is this recording. I'm going to go dig it out and play it right now. I had a duet album with Moffo and Sergio Franchi that I used to love. I am embarrassed that I don't know the "One Night of Love" album. It is so wonderful to discover you, Linz, and others who hear music from its essential core. Thank you for sharing your insights with us. I look forward to discovering all that you recommend. Thanks, James. You're right, by the way, about the LP being better. Apart from the "blip" masquerading as an edit, I find that I need to turn the treble up on the CD to bring out Anna's full radiance. You've never heard Anna's collection of love songs? Oooh, you're in for a treat once BMG get around to releasing it, as I'm sure they eventually will. Her "Kiss Me Again" is ravishing beyond compare. Linz, the lucky bugger, once spent an afternoon in Anna's apartment, recording an interview with her for Radio New Zealand. 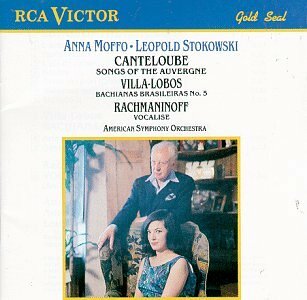 I have an album by Anna Moffo titled "One Night Of Love" RCA RedSeal Dynagroove recording. (LM-2794) The vinyl is in good shape for its age. Some scratches but the album plays well. Is this album a collectors item? This was one of my favorite albums as a kid. 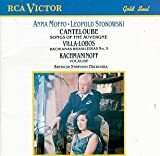 I've since moved on to the Victoria de los Angeles recording of "Songs of the Auvergne"--her voice is not as beautiful as Moffo's, but I find her interpretation both lively and seductive. And it has a much larger selection of songs. But for the Vocalise & the Villa-Lobos, there will never be better recordings to me than these ones. They're some of my favorite pieces, in part because of this record. Thanks for posting this beautiful album.